Tomorrow I leave for a quick 3-day trip to Colorado, and I have several other trips planned over the next few months. Travel has been a big part of my life for quite a while now (you can see some of my travel posts here), and like many of us, one of my favorite parts of visiting new places is being able to snap photos along the way. I'm not a professional photographer by any means, but I've learned a lot of tips over the years that have helped improve my travel photography, and today I'm going to share some of them with you! 2. Don't miss the details. Sometimes we get so wrapped up in taking photos of landscapes and landmarks that we overlook the details. 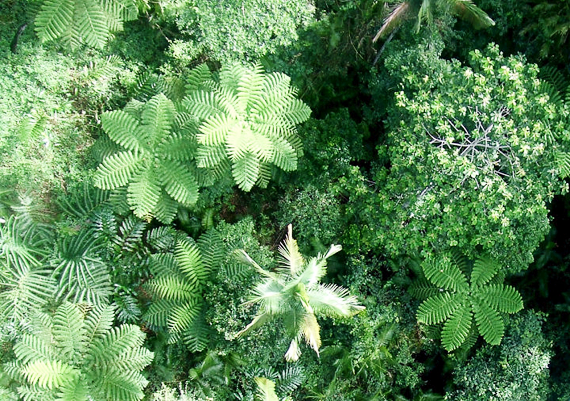 Try taking some macro shots of architecture or bits of nature separate from the 'big picture.' On our recent trip to Michigan, I'd say that about 75% of the photos that we took were of an absolutely breathtaking sunset over the lake. But it was this shot above, which focused on the tall sawgrass and pushed the sunset to the background, that ended up being my favorite. 3. Shoot the nontraditional. Taking photos of traditional landmarks is an important part of capturing the experience of a vacation, but also try taking some shots of interesting things that you stumble upon while exploring. Some of my favorite travel pictures have been those I took of random things that I came across along the way. 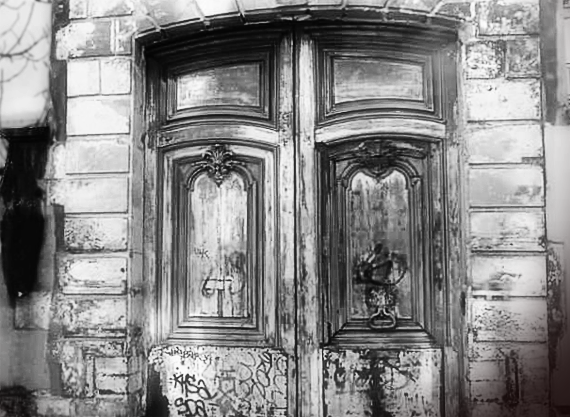 You might even come to find out that the subject of your photo has a cool history, like these crumbling free-standing doors that I discovered down the street from the apartment we rented in Paris a few years ago. I later learned that this eerie facade is all that remains of the Hotel Jean Louis Raoul, which was demolished in the early 1960s. 4. Think outside of the box and be open to trying new techniques. Try taking pictures in a place or situation where you normally wouldn't. 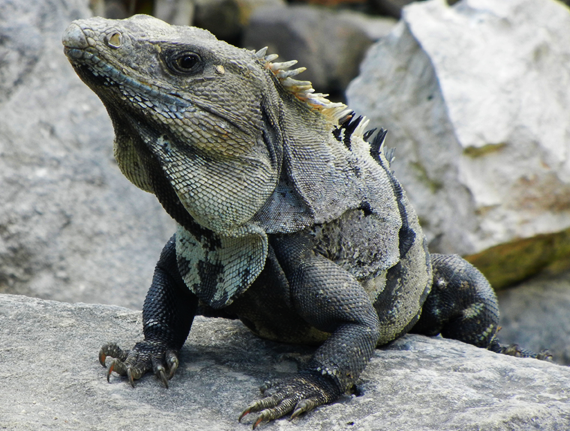 If an excursion is part of your intinerary, find out in advance what your options are for photographing your experience. 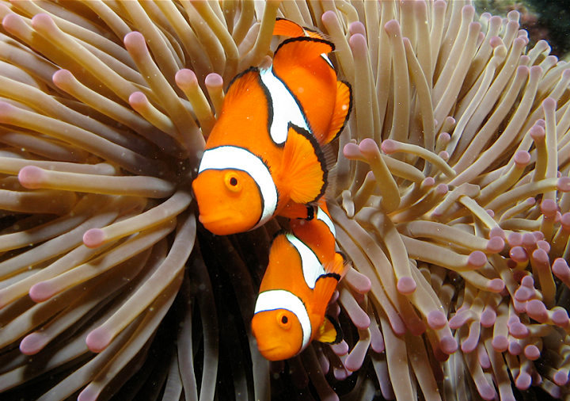 If you're planning an water adventure, for example, see if you can rent an underwater camera. The above photo was shot while we were snorkeling the Great Barrier Reef - a place where you'd normally think amateur travel photography would be impossible. 5. Remember to include people (and yourself!) This might seem obvious, but I can't tell you how many trips I've taken where I've gotten home only to realize that I was so busy photographing my surroundings that I didn't have any photos that included myself, my husband or my friends. If you hand your camera (or phone) to a stranger to take your picture and are worried about the quality of the image, just remember that editing programs like Photoshop Elements are ideal for turning less-than-stellar images into great photographs. And sometimes a truly wonderful photo can be more about capturing an experience or memory than a technically perfect image. 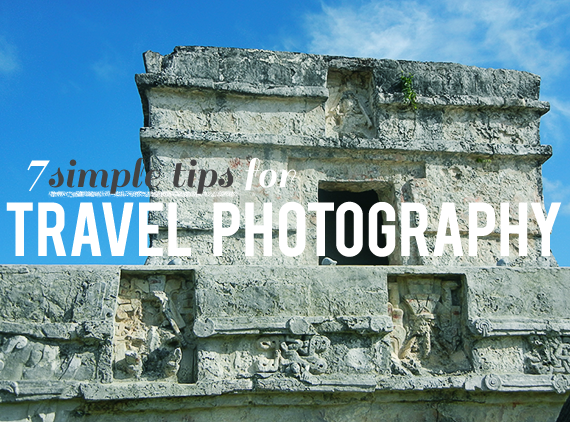 The shot above was taken with a phone after we hiked the Mayan Ruins in Tulum, Mexico. It's not quite in focus and is a little grainy, but it's one of my favorite shots from that trip because includes some of my best friends in a really special place. 6. Play around with shooting at different times of the day. One of the tips I shared during my Adobe Elements Twitter chat a couple of weeks ago was to try photographing in the late afternoon/early evening. Shadows and harsh light are avoided, and your subjects will take on a beautifully soft, warm glow. Sometimes shooting at less-than-ideal times, like during rain storms, can also make for really interesting photos. And don't forget the obligatory sunset photos - they can be a beautiful reminder of your trip, as can sunrise pictures. When we were in Australia a couple of years ago, our jet lag was so severe that getting up before sunrise was easy. 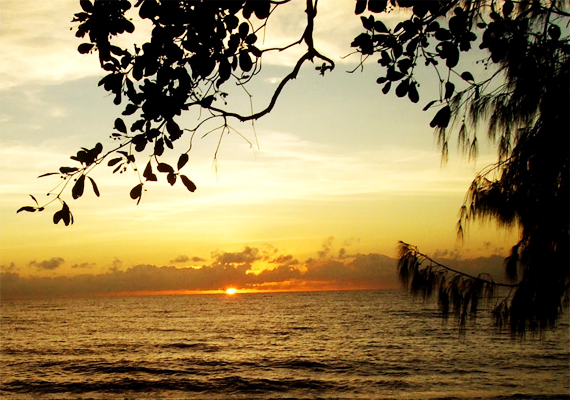 One of my favorite pictures from that trip was the sunrise over the ocean in Palm Cove, Queensland, as seen above. 7. Edit afterward. I mentioned under tip #1 that unless you're taking a trip specifically for photography, it's important to remember to enjoy yourself first and foremost, and not obsess too much over capturing the perfect shots. The beauty in editing software is that you can 'fix' the less-than-perfect shots after you get home! For me, the issue that I run into most often with my travel photos is that I pull them up on my computer upon arriving back home, only to discover that certain shots are blurry. The perfect photo opp will appear during my trip (always when I'm not prepared, of course), and I'll quickly snap a picture without time to properly focus. 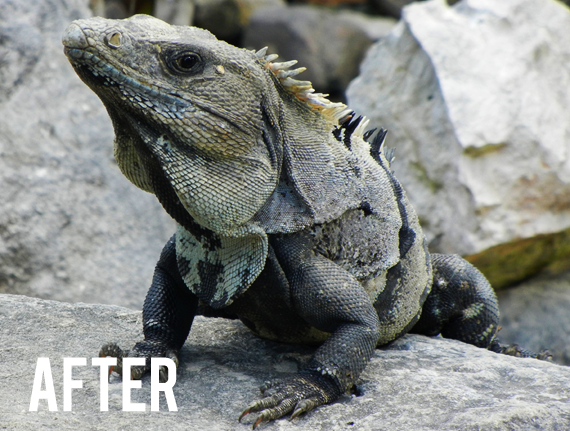 I was disappointed when I realized that the photo above, taken of an iguana in Mexico, wasn't focused, but I was able to fix it in editing. Open your photo in Photoshop Elements (File > Open). A. 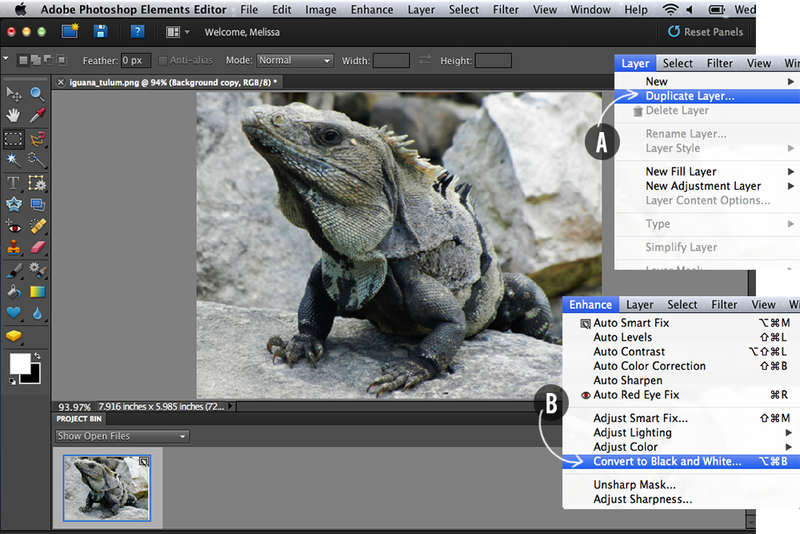 Duplicate your image so you have two layers (Layer > Duplicate Layer > OK). B. Remove color from the top layer (Enhance > Convert to Black and White > OK). C. Add a High Pass effect (Filter > Other > High Pass). D. The High Pass box will pop up; use the slider at the bottom to adjust the Radius until just the faint outlines of your image appear. The higher the radius, the sharper the image will be, but we want to keep the effect subtle. Click OK.
E. In the drop down box in the Layers menu, chose Overlay. 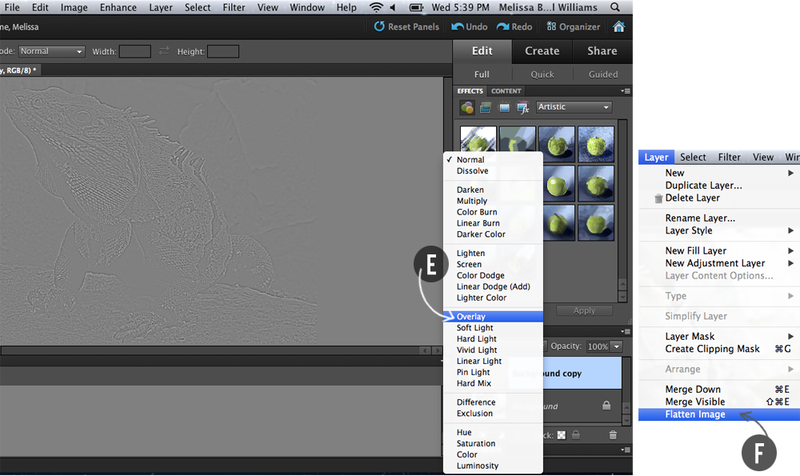 TIP: If your photo looks too sharp, use the Opacity slider in the Layers menu to decrease the opacity of the top layer. 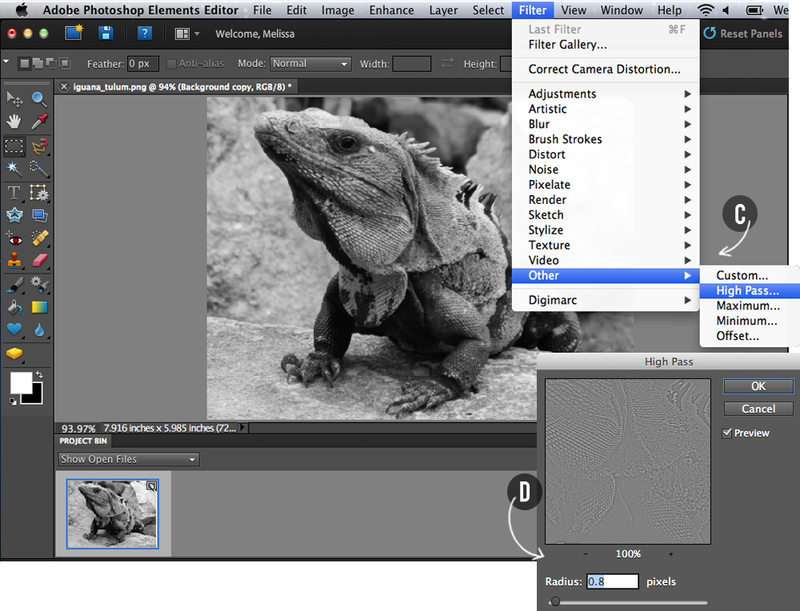 F. Now flatten your image (Layer > Flatten image), and your formerly blurry image is in focus! I hope these tips (and the quick tutorial) prove helpful in your future journeys. And if you have any travel photography tips of your own, I'd love to hear about them in the comments! This post was put together as part of my series partnering with Adobe as a Photoshop Elements ambassador. If you missed any of my previous Adobe ambassador posts, you can view them here: double exposure effect tutorial, dreamy photo effect tutorial, DIY personalized gift coupon tutorial, my San Francisco trip to Adobe headquarters, and my camera and photography equipment. In addition to here on the blog, you can follow my Photoshop Elements Ambassador adventures through the end of this month via my Twitter and Instagram (@bubbyandbean) accounts. You can also keep up to date with the project and other Photoshop Elements goodness by visiting Adobe Photoshop Element's Twitter, Facebook, Pinterest, and YouTube accounts. Wow, this is an amazing photography resource! Thanks for all of the great tips. Great advice! I'm going on a trip this weekend, so I'll be sure to use your tips. Love ALL the tips! 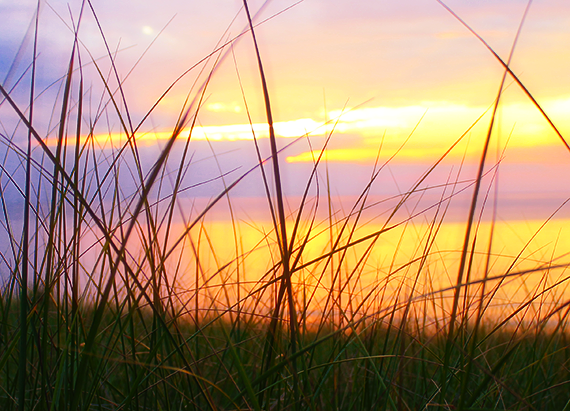 I think the reeds with the sunset in the background is my favorite. I'm gonna have to try noticing the little things. Amazing tips! I love this, great post! These photos are so beautiful and I can't believe all the places you have been! 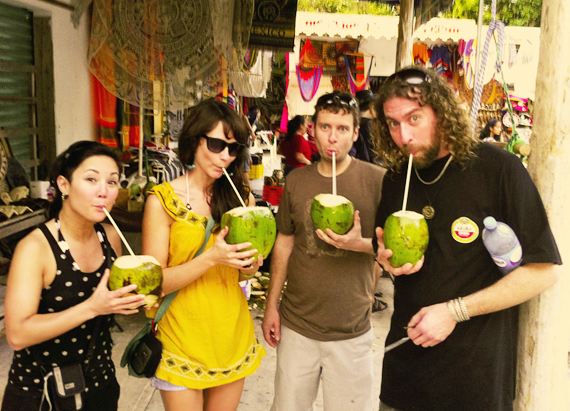 I'm going to Mexico in November and for sure I will use these tips, they're great. The sharpening tip is also super handy. these are really great tips and photos. what kind of camera do you use? Thanks Katie! I have a Canon T2i and usually use a 50 mm/1.8 lens. You can actually see the full run down of my camera equipment in this post. I'm always looking for ways to improve my shots. Thanks for the wonderful advice. I'm going to be trying the sharpening blurred photos in Photoshop. This is very helpful post, thank you for sharing! I hope your trip to Colorado is wonderful and you have a great time!! I hope your enjoy your trip to our great state of Colorado! You gave some great photo tips for complete newbies like me. Your blog is great, and I love your connections to the music world! My hubby and i are big live music fans. That underwater shot is so otherworldly and beautiful~ awesome tips, thanks so much for sharing!